Castle Manila: A replica mid 19th Century house, recreating the Intramuros lifestyle of upper class Filipinos at this time. Chocolate Hills: Bohols most famous attraction: the area is named thus, because of the rich grass which covers them turns brown in summer. Colon Street: The oldest street in the Philippines located in the heart of Cebu. Nagcarlan Underground Cemetery: The only underground cemetery in the Philippines; it served as a meeting place for the revolutionary leaders in Laguna. 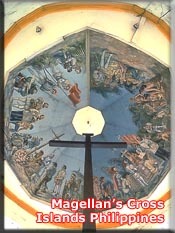 Magellans Cross: The most historically-famous landmark in Cebu. Planted by Ferdinand Magellan in 1521, it marks the place where the first Christian Filipinos were baptized. Katibawasan Falls: These 250-foot falls cascade down to a pool surrounded by orchids and other rich tropical flora- 4 km from Mambajao. Maquinit Hot Springs: Located on a scenic beach corner, this is the premium hot spring in the Philippines. Hidden Valley: A natural recluse is created within this 90-meter crater . A haven for lush jungle life, natural springs and still water pools. Accommodation available. Ninoy Aquino Parks and Wildlife: Quezon Avenue. Rizal Memorial Park: Within the lush park there are monuments, a skating rink and adventure playground. Free concerts every Sunday.